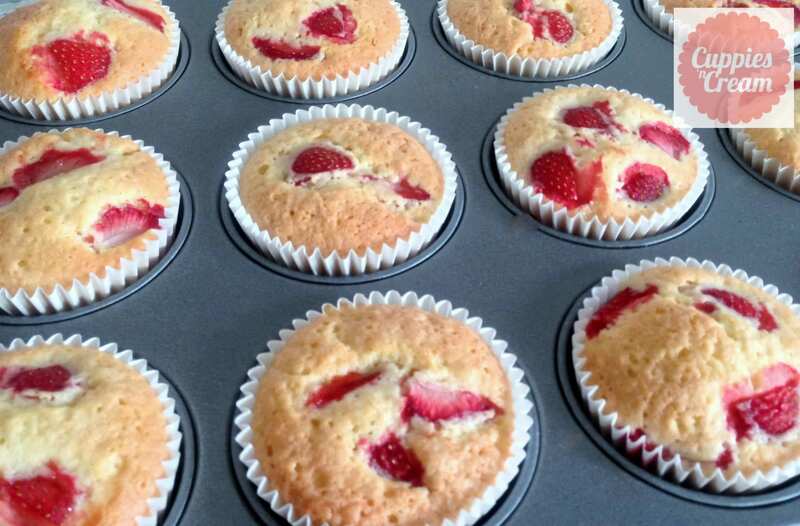 As we are still having some beautiful weather and whilst strawberries are still readily available to pick fresh I thought I’d share my Strawberry Cupcake recipe. These cupcakes have been a huge hit this year and I have to confess that I always bake quite a few extra for myself, as I just love them. Once baked the cupcakes are very moist and delicious and a must for any summer dessert. I’ve even tried one warmed up with a little bit of custard and it was heavenly. The fresh strawberries combined with the delicious creamy buttercream is a perfect combo. Seriously though, if you want to try a fruit based cupcake you really need to make these. They are very simple and easy too. Crack and beat your eggs in a separate bowl with the salt and add these gradually to the mixture. I normally do this in 2 parts. Add the flour in two parts – taking care not to overbeat. Remove immediately from the cupcake tray onto a cooling rack. The smell of these whilst they are baking and when they come out of your oven is amazing! They smell so delicious. These cupcakes go with pretty much any type of icing. My favourite is with white chocolate buttercream but you could also use cream cheese frosting, Italian meringue buttercream or even ganache. For an Extra Twist add some champagne – they taste amazing! Add some mint extract to your buttercream, or blend your strawberries into a syrup rather than chop them. Dye your cake mixture pink? Maybe even for your strawberries you use for decorating you can dip in chocolate – total decadence.. In the summer months buttercream can be quite messy and even melt if you are not careful! One tip is to replace 1/4 of your regular icing sugar with Royal Icing sugar as this will help it firm up quicker and keep its lovely texture without affecting the taste either. Well it sounds easy enough…. I might give it a go for my friends birthday next week…. Or I might just pop to the shops and buy a few! Can I ask what buttermilk is and where do I find it? These look amazing. Also daft question do I need a cup cake tray or will a normal tin do? Ps love your posts. They are my bed tome reading. I actually like this recipe. I have to try it.